Next Question brings this back around to the very beginning of the series in our thirteenth and final episode. It does what a good season finale should do: leave questions unanswered. Unfortunately, because Golden Boy was cancelled long before Next Question aired, the little tidbits we are given will never be resolved. Thus, what eventually happened to Detectives Owen (Chi McBride) and McKenzie (Bonnie Summervale), whom we are told met an unhappy end, will remain forever hidden. These questions would have been answered as the series (would have) continued, but Next Question leaves other questions that the second season premiere would have answered. As an individual episode, Next Question does better than some of the ones that have come before, but truth be told the series had put itself in a corner that it couldn't get out of. Scenes in this episode include flashbacks to the 9/11 attacks on the World Trade Center. Viewer discretion is advised. Nothing like using the horrific mass murder of thousands of people to close out a season of a low-rated television series. 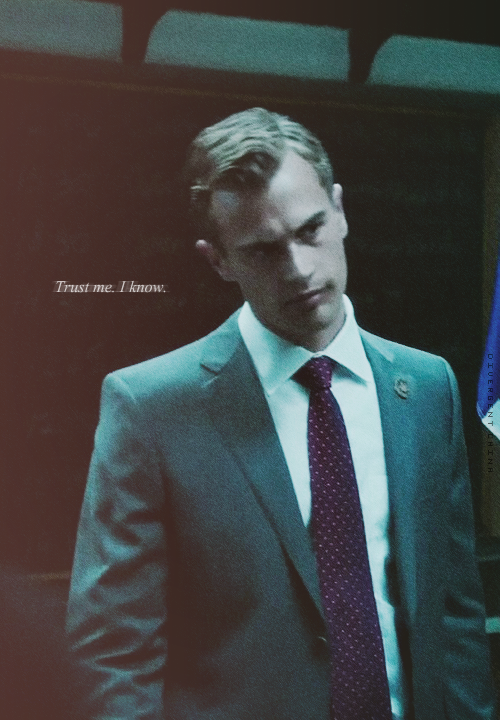 Commissioner Walter Clark (Theo James) is still being interviewed by Paul Daly (Richard Kind). The Commissioner is admiring the Freedom Tower, the building that will rise 1,776 feet over New York City near where the World Trade Center once stood. We then go back to present day, where Detective Clark, having been relegated to desk duty, is given something to do by his partner, Don Owen (Chi McBride). He brings out his old cold case, that of Jozef Dworaczyk, a recent Polish immigrant who happened to be murdered on September 11, 2001. In the midst of all the chaos of that day, he was kind of forgotten. We now get flashbacks within flashbacks (if we go by the premise that Golden Boy really takes place seven years from now). Owen is now in the Clark position, attempting to sort out this bizarre crime, bizarre in that Dworaczyk had no enemies. He is in turn mentored by Andrew Lightstone (Robert John Burke), who advises him to never promise someone they will find the perp. Circumstances force Lightstone to go the World Trade Center while Owen continues the case. He is able to observe the second plane hitting the second tower, and later on, as he attempts to reach his partner and friend, the towers fall (though Owen bravely rescues a pregnant woman about to be engulfed by the debris). In yet another of those strange twists Golden Boy takes, the Dworaczyk case is related to the case the 39th Precinct is handling, a drive-by where the driver is unharmed but the passenger is killed off. Clark finds that Eddie Roque (Peter Scavanivo), who bore a striking similarity to Dworaczyk, has left prison. Roark we find not only was the intended target but knows who put out the contract on him because Roark himself had used the same hitman. Roark, who now has months to live, decides that he might be in need of some redemption. He tells Clark who the hitman is: Pablo Vega (Eric Todd Dellums...and is it me or is there something odd about casting an African-American in what would appear to be a Hispanic role?). Cracking the case of a hitman would have great implications for whoever brings him in. That person, in the mind of Detective Christian Arroyo (Kevin Alejandro) is none other than Detective Christian Arroyo. Arroyo really could do with some good news, given that he has had simply the worst day of his life. First, his wife has found out that he has been having an affair. While she hasn't found who his mistress is, he is unceremoniously dumped. Next, his actual mistress, Deb McKenzie (Bonnie Somerville) has really moved on, and he is actually heartbroken. Third, he has grown tired of Clark thwarting him at every turn and will get that promotion. He won't let some old man or his junior partner get in his way, especially since his onetime ally Deputy Mayor Holbrook (Eric Morris) all but screwed him over. However, the hits keep on coming, literally: to add to Arroyo's awful, terrible, no good, very bad day, Mamma said knock Arroyo out. Clark punches him unconscious and then handcuffs him to where he can't go with everyone else. Roark goes to the shop to attempt to hire Pablo, but Pablo in turn tries to kill him. He at first encounters Clark when attempting to flee, but since Clark has no gun or badge, he slashes him out of the way. Owen, however, DOES have both. Pablo, in his own way, is in need of redemption: he had given up the hitman job after the botched killing, for which he feels actual guilt. With both cases solved (at least I think both solved...we've all but forgotten about the first), Owen not only is able to close out his last case with Lightstone but bring peace to Mrs. Dwaraczyk and I figure her now 11-12 year old son (she was pregnant at the time she became a widow) AND get a promotion. While Arroyo himself does nothing at this point, we know Deputy Mayor Holbrook does. 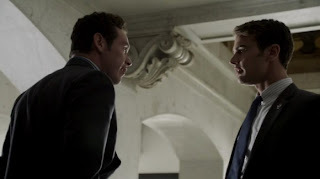 We discover that Holbrook has allowed innocents to go to jail (connected to this corruption case or the hitman job, I forget). That, along with Clark sleeping with his wife, push him over the edge. He approaches Clark and Margot while having dinner, first turning a gun on him, then on her. The screen goes dark as shots are fired. In a subplot, Junior finds that he needs the shady connections of Senior (Michael Madsen) to crack the case. Senior for his part, convinces his daughter Agnes (Stella Maeve) to take a ride with him...what could have been for next season. Next Question ends with us learning that Clark will now work to clear the innocents blamed for Pablo's killings, but that this cost him two weeks in a coma, and that both Owen and McKenzie are in seven years no longer with us. As I stated, Next Question left us with a host of questions: what DID happen to Margot? how did Owen and McKenzie meet their ends (the pilot did suggest something about a shooting, but whether that would have happened in the future or was what already occurred in Sacrifice we know not)? What will become of Arroyo now that his life seemed to implode in one day? Those questions are likely never to be answered now that Golden Boy has been cancelled, but for myself I am not a fan of long teases (which might explain my dating life, but I digress). Nicholas Wootton, Golden Boy's creator, penned the season/series finale, and I trust that he knew the wisdom of featuring September 11th as part of his story. I do not look kindly to such things, fearing that such a horrific and traumatizing event in human history should not be relegated to a plot device. That, however, is not the only thing I found fault with in Next Question. Again, the idea that all the cases have to be connected somehow is something I'm finding more and more ludicrous (McKenzie's brother, Holbrook's Client Number 9 deal), and now this: a twelve-year-old murder conveniently coming together with the case they are investigating? That point I might concede only because I cannot recall anything about the present-day murder, which is not a good thing. That isn't to say Next Question didn't have anything good in it. Michael Madsen, though underused in both his episodes, has a good comeback at the beautiful Theo James' expense. This is the first time they have seen each other in years, and Walter Clark, Senior greets his son with, "How's your modeling career?" Cinematically, I thought it was highly clever that McBride's Owen in his flash-flashbacks would enter the light whenever he threatened someone, but slip into the shadows when he was being soft and gentle; this is a good twist in the visual department. Credit also has to go to Alejandro, an undiscovered acting treasure who really needs to work more. Apologies to the breathtakingly beautiful James, but Alejandro was the more compelling actor with the deeper character as opposed to James' Clark, whom the series kept shifting from good to bad. I know, that was the point of Golden Boy: to see how he became whoever he became, but James was a bit more bland, especially to the good cop/bad man Arroyo who in one season we see slowly evolve and even crumble. Clark just seemed to be more grumpy and short-tempered, as if his years on the force did not shape him into someone with more (or less) compassion or insight. Arroyo on the other hand, was the more fascinating character. I'll give you that James is prettier than Alejandro (though the latter ain't bad-looking by any stretch), but I would give Alejandro the title of 'better actor'...and he wasn't the lead. It almost made me wish Arroyo had punched Clark. Heaven knows he had many reasons to do so. Next Episode: None due to Cancellation.